North Alabama built its fi rst commercial brewery in Huntsville in 1819, three months before the state joined the Union. Before Prohibition in 1915, the region was peppered with numerous saloons, taverns and dance halls. Locals still found ways to get their booze during Prohibition using Tennessee River steamboats and secret tunnels for smuggling. Alabama re-legalized beer in 1937, but it wasn't until 2004, when the grass-roots organization Free the Hops took on the state's harsh beer laws, that the craft beer scene really began to flourish. 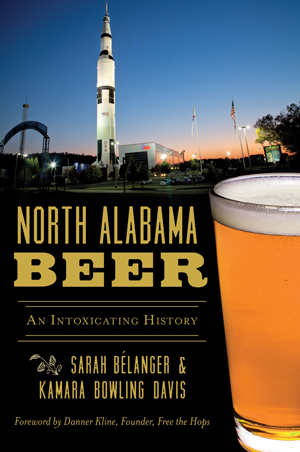 Authors Sarah Bélanger and Kamara Bowling Davis trace the history of beer in North Alabama from the early saloon days to the craft beer explosion. Sarah Bélanger is a writer, food photographer and beer blogger based in North Alabama. She has written for many local magazines, including NoAla Magazine and Huntsville's Event Magazine, and is a beer blogger for the Huntsville Madison County Visitor's Bureau's blog iheart.com. As a food photographer, she has worked for numerous brands, including Southern Living, Cooking Light and Betty Crocker. Sarah first experienced craft beer while getting her master's degree from the University of Alabama, and although she remains an enthusiast, while writing this book she discovered she has a gluten allergy and, alas, can no longer drink it. Sarah lives with her husband in Madison, Alabama. This is her first book. Kamara “Kami” Bowling Davis earned a Bachelor of Science degree in secondary education from the University of North Alabama, with specialties in history and political science. She worked for a decade at the U.S. Space and Rocket Center, rising from Space Camp counselor to director of sales. Kami is a veteran of the U.S. Army and a self-proclaimed “Cat Lady” who gained her interest in craft beer through exposure to the vast quantities consumed by her husband. Rather than fight against his love of beer, and knowing that resistance was futile, Kami jumped right in. She became an expert in the field, knowing more about beer than her husband. She resides in Northern Alabama with her loving husband, three cats, two dogs and an evil rabbit.